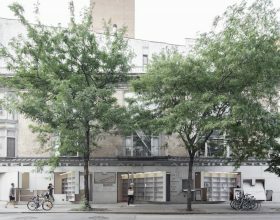 The iconic rotating facade panels at the Storefront for Art and Architecture have been reconstructed as mostly-empty bookshelves in an installation currently on view at the Soho gallery. Abruzzo Bodziak Architects (ABA) designed the sidewalk-encroaching shelves for the exhibition, dubbed Architecture Books-Yet to Be Written. As its name suggests, the installation “seeks to celebrate and evaluate both existing and the missing volumes of a history still in the writing.” ABA’s design will be on display until August 25 as part of the New York Architecture Book Fair, an initiative introduced by the gallery.